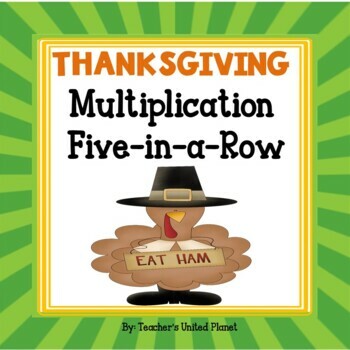 Thanksgiving Multiplication 5-in-a-Row is a fun way to learn multiplication facts from 1-6. Students take turns rolling 2 dice and multiplying the numbers together to find the product. 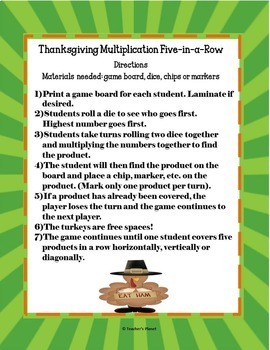 Students find the product on the Thanksgiving 5-in-a-Row board. 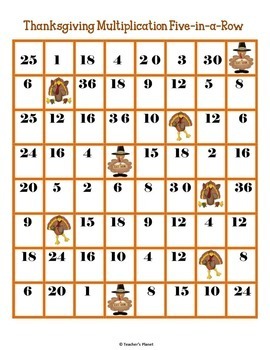 The turkeys are free spaces! The first student who covers five numbers in a row either horizontally, vertically or diagonally wins! Students love this game! A fun way to learn multiplication facts. Great practice for the Common Core! Multiplication Mega Pack! 4 Fun Games! Would you like to receive TPT credit to use on future purchases? Just go to your My Purchases page and click the Provide Feedback button. You then can give a quick rating and leave a short comment for the product. Thanks for your purchase!